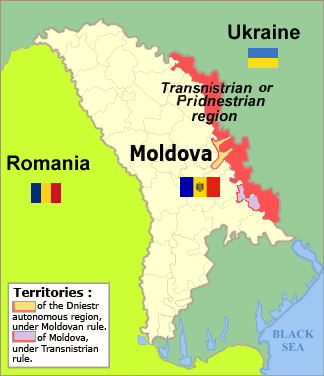 Transnistria, a sliver of land at the eastern border of Moldova, right next to the Ukraine, wanted to be part of Russia, not Moldova, when the former Soviet Union broke apart in 1992. 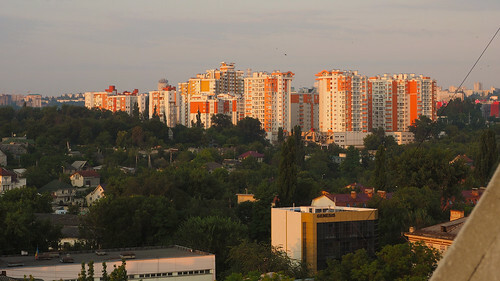 Refusing to assimilate into Moldova, Transnistria continued to use the Russian ruble even after Russia had issued new rubles and stopped accepting the old-style currency as legal tender. The Transnistrians added a postage stamp to the Russian rubles to indicate they were their currency. Since the collapse of the Soviet Union, Russian troops have been present in Transnistria. While my husband Alex and I were in Moldova, from 1992 until 1994, General Alexander Lebed was in command of the Russian 14th Guards Army in Moldova which was involved in skirmishes in Transnistria and another semi-autonomous region, Gaugazia. The Organization for Security and Cooperation in Europe (OSCE) has had a presence in Moldova since the early 1990s, charged with facilitating a negotiated settlement between Moldova and Transnistria. At the time we were in Moldova, the ambassador from the OSCE to Moldova was a Canadian. One weekend, he, his wife, one of his local staff, Oksana, the U.S. Ambassador to Moldova, Mary Pendleton, Alex, and I set off for a relaxing few days in Odessa, on the Black Sea coast of the Ukraine. We left Friday afternoon in two cars, the OSCE ambassador, his wife and Oksana in one, Ambassador Pendleton, Alex, and I in the other. The OSCE ambassador’s car was in the lead since Oksana was to be our translator for the trip. She was to explain to the guards at the Transnistrian “border,” which the U.S. government did not recognize, why we needed to be given speedy and unimpeded passage through Transnistria to the Ukraine. Oksana had been a university student in Odessa and she was very eager to show us what Odessa had to offer. Her initial responsibility, getting us through the Transnistrian border, was not a problem as Ambassador Pendleton was waved through without having to stop. Once we reached Odessa, we checked in at a private sanitarium at the edge of the city. The name conjured up visions of patients with tuberculosis or schizophrenia, but Oksana explained it was a place that offered a relaxing and calming setting and was very desirable for weekend stays. We didn’t spend much time there. That evening we headed for a meal at a restaurant overlooking the coastline and beach. The restaurant was full of very well-dressed, cosmopolitan young couples, some of whom looked as though they had just walked out of a stylish European casino. There was music and dancing, although we chose to remain spectators as the fashionably dressed couples filled the dance floor. The next day we toured several museums, many of them with a strong military slant. We also went to see the Potemkin stairs, originally 200 steps leading from the city situated on a high steppe plateau to the harbor. That evening we went to a concert where one of the most noticeable acknowledgements of the change in the government was the hole in the flag on the stage curtain where the hammer and sickle had been. After the concert, Oksana suggested we go to a hotel that was well known for its entertainment at the bar. As she had done at nearly every other stop, she recommended that we not park directly in front of the location we intended to spend our time. Instead, she had the OSCE ambassador drive around the corner from the hotel where she located two parking spots so that the two cars would be parked one in front of the other. It may have been that desire that the two cars remain close to one another than led her to make the recommendation. We didn’t ask; we just wondered. The next morning, Sunday and our last day in Odessa, Oksana recommended we have breakfast at a famous downtown restaurant before we headed a short distance out of town to see another Ukrainian Black Sea site. At this location, there were plenty of parking spaces directly in front of the restaurant, including on a very wide sidewalk where others parked their cars. But instead, Oksana again took us around the corner to park the two cars out of sight, and we then walked back to the restaurant. At the end of the meal, we walked back to the corner. It was immediately obvious that something was wrong. There was only one car on the street, Ambassador Pendleton’s Honda. The OSCE ambassador’s Lada was missing. Instead of spending a short time at the other site after which we planned to travel back through Transnistria, arriving at the border while it was still daylight, we ended up back at the restaurant where we had had breakfast and Oksana called the police. Gasoline was in very short supply in all of the former Soviet Union at that time, so when Oksana got through to the police, she was asked to arrange to pick up a policeman who would investigate the missing vehicle. Ambassador Pendleton, the OSCE ambassador, and Oksana headed out to pick up the policeman, leaving the OSCE ambassador’s wife, Alex, and me behind. Once the policeman was on site, he seemed optimistic that they would be able to find the ambassador’s car. He recommended that we just wait. In the meantime, Ambassador Pendleton, the OSCE ambassador, Oksana and the policeman made a few other stops to file reports and investigate options. By 3 p.m., Ambassador Pendleton was concerned that if we didn’t leave soon, we would arrive at the Transnistrian border at dusk. She did not want to confront the informal Transnistrian militia at any disadvantage, so she began to press for the six of us squeezing ourselves into her car so that we could return. Oksana assured her that she could get us past the border without a problem, so waiting a little longer would be fine. So we waited. By 5 p.m., Ambassador Pendleton decided waiting any longer was out of the question. She insisted that the six of us get into her car and head back. But Oksana and the OSCE ambassador were unwilling to give up. Instead of getting into Ambassador Pendleton’s car, they agreed that the four of us–Ambassador Pendleton, Mrs. OSCE Ambassador, Alex, and I–should head back to Moldova while they waited in town until the car could be located. Oksana gave Ambassador Pendleton directions for what she called a short-cut so that we would get to the border more quickly. The four of us left, now minus the only Russian speaker among us, and headed for the border as the sun sank lower and lower. By the time we reached the border, daylight was nearly gone and we realized that the guards there, most of them very young men without any identifiable uniforms, had been standing in the sun while drinking all afternoon. When the car stopped, the guard who approached the ambassador stumbled as he walked towards the driver side window. His rifle was slung over his shoulder, but the other guards were holding their rifles by the barrels, resting the butts on the ground, like walking sticks. The guard insisted the ambassador get out of the car. She tried to speak with him in Romanian, but that didn’t work. He motioned for her to go to the back of the car and then he pointed to the trunk, indicating he wanted her to open it. She did. But when he started opening the suitcases in the trunk she pushed his hands out of the way and told him he didn’t have any right to inspect anything in her car because we were all diplomats and her car had diplomatic plates on it. She closed the trunk, got back into the car, put it in gear and drove off. The rest of us slunk down into the seats so our heads were below the level of the back window, expecting the worst. Originally published in The Guilded Pen, Third Edition, the Anthology of the San Diego Writers/Editors Guild. When the former Soviet Union broke apart, the small country of Moldova was one of many that emerged from its ruins. Many pundits expected it wouldn’t last, that it would be absorbed by its neighbor to the west, Romania, as part of a grand reconstruction of what had been the country of Romania before the end of World War II. But on the ground, Moldova looked very different from Romania. While all of what makes up modern day Moldova was once part of Romania, the language continued to be written in Cyrillic script in Moldova, in contrast to the adoption of the Latin alphabet in Romania back in the 19th century. The switch from Cyrillic to Latin alphabets in Moldova occurred in the last decade of the 20th century, more than 100 years later. By the time I arrived in Moldova in 1992, the street signs had all been replaced to display the names in the Latin alphabet, but the transformation was not yet complete. The ambassador at the US embassy in Chisinau spoke Romania, not Russian. The political/economic officer spoke Russian, not Romanian. They attended a concert together where the program handed to all attendees was in Moldovan in Cyrillic script. The Russian speaker “read” the words aloud for the Romanian speaker to translate into English, the only way either of them could understand the program. 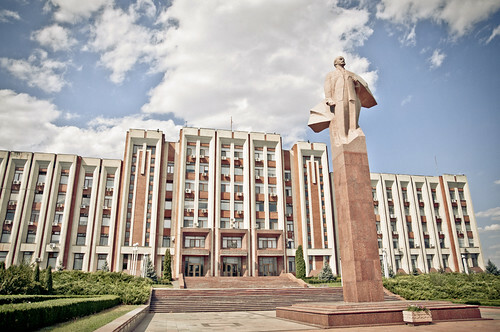 After World War II, the Soviets moved ethnic Russians into positions of importance in the Moldovan capital to run the banks, factories, and schools. This further diminished the role of the Romanian language, which by the time of independence was used primarily on the collective farms. Since Russian was the language taught in the schools, many people who spoke Romanian only did so at home. The version they spoke often made them sound like peasants, not professionals. Yet in 1989 the state language law declared that Moldovan citizens have the right to choose Russian or Moldovan when doing business with the government. A deadline in the early 1990s was specified. Educated Romanian speakers had no difficulty meeting this requirement. The deadline has been indefinitely postponed because of the large number of Russian speakers who cannot speak Moldovan. The embassy had a difficult time finding Romanian speakers in Moldova who also spoke English. The Romanian speakers often spoke French or Spanish in addition to Russian. As a result, we had to recruit staff members who were at least trilingual–Russian, Romanian, and English. A British comedy writer, Tony Hawks, wrote a book about his effort to win a bet that he could play and beat all the members of the Moldovan national football team at tennis. At stake–the loser would have to strip naked and sing the Moldovan national anthem on Balham High Road in London. You don’t need to know anything about Moldova or tennis to enjoy the book. If you read it, I predict you will, like Tony, agree that Moldovans are the friendliest people in the world.